Life Without Goods Made in China a Challenge A Year Without "Made in China": One Family's True Life Adventure in the Global Economy chronicles how Sara Bongiorni and her family tried to live without buying anything produced in China. A Year Without "Made in China": One Family's True Life Adventure in the Global Economy chronicles how Sara Bongiorni and her family tried to live without buying anything produced in China. Now how one woman and her family dealt with Chinese imports. In January 2005, business writer Sara Bongiorni made an unusual New Years resolution. She and her family pledged to spend the year without buying anything from China. She's chronicled that experience in a new book, "A Year Without Made in China." Ms. SARA BONGIORNI (Author): At the outset the rule was just avoiding things that had the label Made in China, or if we happened to know that there was a Chinese component in something, we would avoid that too. Of course oftentimes you can't know that, but we decided we would just set the bar there. So in that sense we set the bar comparatively low and yet this experiment absolutely turns a daily life upside down. It was everything from, you know, mundane ordinary errands like running to the store for new tennis shoes for one of the kids or buying birthday candles became days or sometimes weeks-long sagas that didn't necessarily have a satisfactory resolution in the end. WERTHEIMER: The tennis shoes was something that really struck me. I mean, you had a terrific struggle to try to find shoes for your child. Little sneakers seem to be something that's almost exclusively Chinese. Ms. BONGIORNI: That's absolutely right. It took me two or three weeks of searching and eventually I located sneakers made in Italy in a catalog, and with shipping they cost almost $70. And that compares to maybe $15 for a pair of ordinary tennis shoes that are made in China at some place like Payless Shoes. So I could really appreciate the benefit of having access to low-cost goods from China. WERTHEIMER: You actually made financial sacrifices to do this. I mean, this was not a financially feasible thing to do. Ms. BONGIORNI: I think on balance, it was probably a wash financially. But the reason was, although we had to spend more money on some items, lots of times we simply couldn't find a non-Chinese alternative to many things. So we ended up just keeping our money in our wallets because we had no option. We had to cobble together some sort of solution on our own or just do without for the remainder of the year. Ms. BONGIORNI: Well, our coffeemaker broke and all ordinary drip coffeemakers are made in China. So we ended up boiling water in a pan and just pouring it over filters into our coffee mugs. Our blender also broke about mid-year, and we couldn't repair it because the replacement blade was made in China, so that sat there gathering dust. WERTHEIMER: You clearly demonstrated that the family Bongiorni have a relationship to the international economy. But what else do you think you proved to us or to yourself about giving up China? Ms. BONGIORNI: What doing this really brought home to me was that we are so closely connected to the rest of the world for what we want and need. And as you know from reading the book, sometimes there's ambivalence about that, but there's also big part in me that likes that and wants to embrace our connections with the rest of the world. So I found it very satisfying, I guess, to find out how connected I am to this big, fuzzy concept to the global economy. WERTHEIMER: Did you decide at the end of the year that you were still going to boycott China? Did you move on? Ms. BONGIORNI: Well in the end we had to find a way to come to terms with the world as it is. We couldn't live like this forever. I mean it really did become an all-consuming project. So we found a middle ground at the end, and yes, we do buy things from China again. WERTHEIMER: Sara Bongiorni, thank you very much for this. Ms. BONGIORNI: Thank you so much. 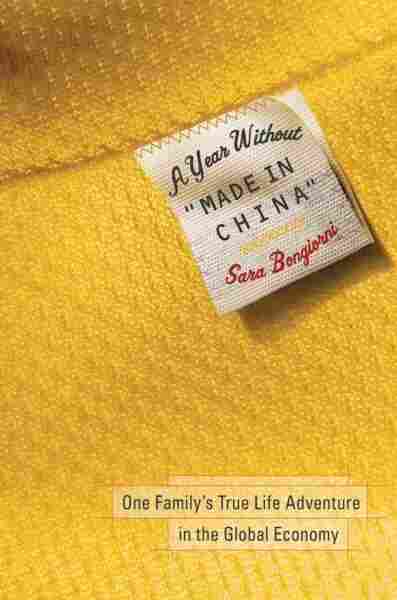 WERTHEIMER: Sara Bongiorni is the author of "A Year Without Made in China."